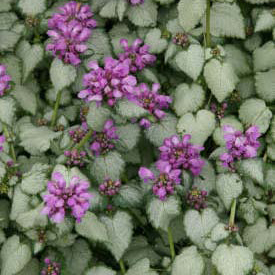 Lamium is one of the best choices for a tough yet showy perennial groundcover. This classy-looking selection forms a spreading patch of small silver leaves with a narrow green edge. Clusters of purplish-pink flowers appear in spring, then continue off and on until fall. Fairly tolerant of dry shade, once established. Trim back in late winter. Stems will root into the ground where they touch, and any new plants that form can be easily moved in spring or fall. Also easily divided. Evergreen.